Day 13 of "30 Days of Me"
Your favorite musician and why? 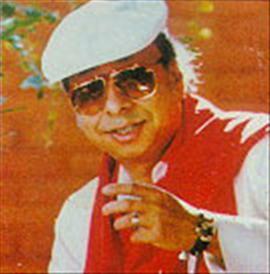 Of course, it's none other than the legend Rahul Dev Burman... "Pancham Da"! An artist far ahead of his times... we're still remixing his old songs even after decades! And the variety in his music... UNBELIEVABLE! These are just 15 of the most popular songs of the maestro -- all in different varieties -- but Pancham Da gave the music for 331 movies, including some in Bangla, Marathi, Tamil, Telugu and Oriya. And I'm sure we all have a whole lot of other personal favorites among his awesome compositions. So please feel free to add to the list in your comments below. This is my 13th post for NaBloPoMo September 2011.